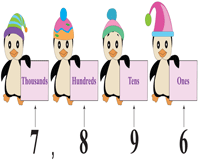 Pin up or hand out this ensemble of vibrant theme-based charts for students of Grade 3 to further enhance their knowledge in place values ranging from thousands up to hundred thousands. Download our poster templates and customize them according to your convenience. Distribute our print-ready color and monochrome blank charts. 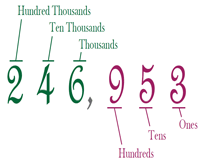 Pin up these colorful place value charts to teach students identify place value of 4-digit numbers. The posters are illustrated with cuddly penguins, spinner wheels, and a digital ticker. 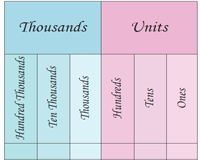 Pass around these printable charts in the classroom to learn the place values up to ten thousands. These charts comprise furry animals and balloons that form a perfect visual aid for learners. Download this entire set of vibrant charts to comprehend the place values up to hundred thousands. These appealing print-ready posters contain circus animals and a choo-choo train! 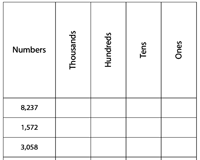 Employ these handy blank charts, available in both color and monochrome to assess a student's comprehension on the place values up to hundred thousands. It makes for an ideal classroom activity. 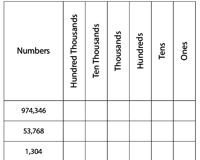 This set of worksheets is categorized into place value of thousands, ten thousands and hundred thousands. 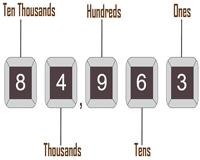 Read each number and fill in the appropriate place value boxes accordingly. Use this series of worksheets to test your child's proficiency in identifying place values ranging from thousands to hundred thousands. Use the answer key to validate their responses.